A panel at a Raymond James event describes the steps financial advisors should take to best address their needs. Panelists Rita Droney (left), Leslie Harvey, Linda Gibbs & Yvonne Wiseley. 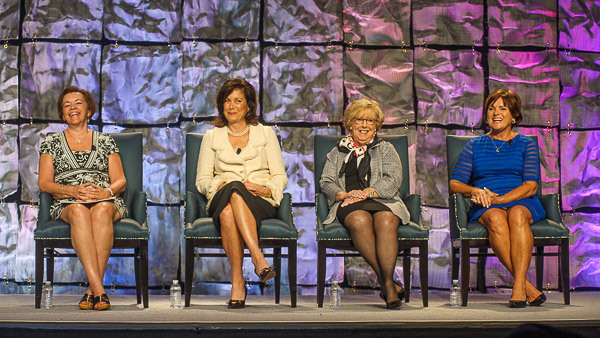 To pay for the costs involved with living longer, retirees – especially women – need to work with advisors and stay invested in the markets, according to a group of clients who spoke at the 2015 Women’s Symposium hosted by Raymond James. To be and to stay invested, she adds, it is vital to have an advisor who is compassionate. “We had a good start to our relationship … and I feel comfortable in it,” Droney stated. The client, who used to work in real estate, was one of four women to share their views on advisor-client relations before an audience of about 300 advisors and 200 other guests at the St. Petersburg event. The four clients described their desire to get more than just generic information from their advisors and to be able to forge a personal relationship, rather than work long distance. The clients generally say they see their advisors as part of their broader support group. She explains that her advisor communicates with her one a month or so “and is not hiding in the corner” when the markets get messy. “I like working with someone who has my back,” Droney stated. Thanks to the trust Gibbs has developed with her advisors, “I’ve come to depend on them, and they have steered me in right direction,” she said. In addition to working with advisors after life changes, such as the loss of a spouse or a move to partial or full retirement, the clients say they are most interested in being able to maintain their independence as they age.